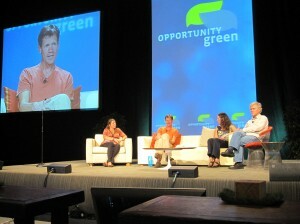 Greening your organization alone is not enough—you also need to give back to your community. That was the key message of today’s session on corporate philanthropy. Panelists included Terry Kellogg of 1% for the Planet, Rick Ridgeway of Patagonia, and Jenn Orgolini of New Belgium Brewery. 1% for the Planet connects companies who pledge to donate 1% of their sales to nonprofits that need the cash. By end of the year, the organization will have raised $70 million dollars to date. “We’re establishing the gold standard for corporate philanthropy,” Kellogg said. Before participating in 1%, New Belgium’s Orgolini said they questioned if they should donate the money instead in greening their own operations. Ultimately, she said, they decided that just focusing on their own business was not enough.